High drama day sees KTM duo Styke and Gibbs split victories. 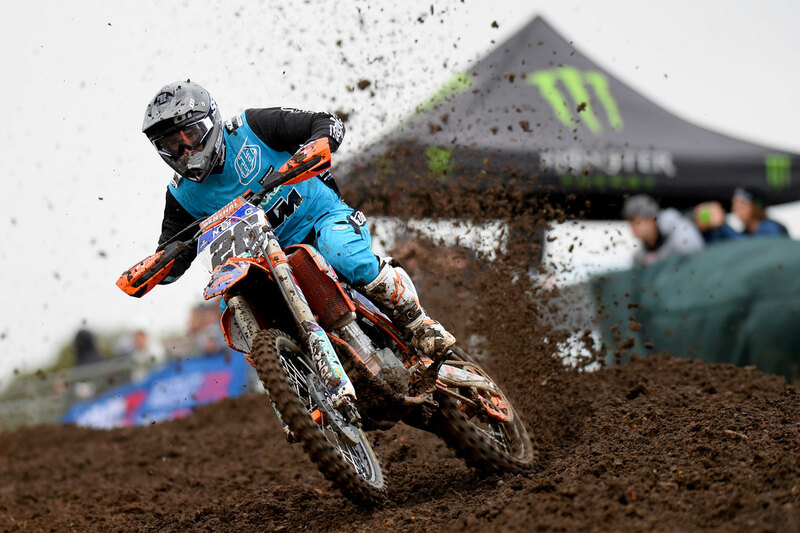 KTM Motocross Racing Team’s Luke Styke has claimed a convincing first MX1 round victory at Broadford’s third stop of the 2015 MX Nationals this afternoon. Former MX2 champion Styke broke through for his first-ever MX1 win in a controversial first race, after CDR Yamaha teammates Dan Reardon and Kade Mosig crashed together while in positions one and two. Reardon led early before coming under pressure from Mosig, the pair’s lines soon coming together and ruling Reardon out of the moto with bike damage as a result. That left Styke to soldier on for victory over Adam Monea and the much-improved John Phillips, who fended off fellow Kiwi Cody Cooper and rookie Kale Makeham in a consistent effort. The top 10 was a mixed bag, featuring Jesse Dobson in sixth, Kirk Gibbs seventh after multiple heavy crashes, then Dylan Long, Cheyne Boyd and Daniel McCoy. Ford Dale was an uncustomary 11th from Mosig, who managed to salvage 12th, Lawson Bopping 13th and Aaron Tanti 14th after he was strong in the opening part of the moto. Gibbs bounced back to win the second MX1 moto after an entertaining duel with Reardon. It was Gibbs who led the opening laps and then Reardon took charge, but by the end it was Gibbs who made his way to the front for the final moto win of the round. Reardon was second and the ever-consistent Styke third, which secured him his first round victory of the year and in MX1 ahead of Adam Monea, fourth in moto two, and Gibbs overall. In the moto finishing fifth was Dylan Long, while Cooper, Bopping, a frsutrated Mosig after another crash, Makeham and Boyd. Dobson was outside the top 10 this time in 11th, as was Phillips in 12th and Dale down in 16th. Daniel McCoy was a notable non-finisher at the end of the moto. The championship leader’s red plate still belongs to Gibbs, now ahead of Styke in second for a KTM 1-2, and Mosig currently sitting third despite a disastrous day at Broadford. 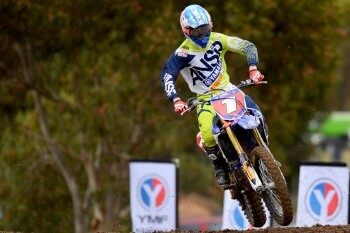 Serco Yamaha rider sweeps Victorian round to extend points lead. Serco Yamaha’s Luke Clout has extended his lead in the 2015 MX Nationals MX2 ranks at Broadford’s third round today, claiming a first-career clean-sweep of the class. Clout controlled the opening moto and maintained his advantage for the victory, while Jay Wilson hung on for second after a last lap challenge from Jed Beaton. Beaton went to make a move with two turns to go, but got ejected over the handlebars of his YZ250F before quickly remounting to salvage third. Fourth was Taka Katsuya ahead of Wade Hunter, who was inside the top three for much of the moto before dropping to fifth in the later stages. A late charge from Geran Stapleton saw him climb to sixth past Dylan Wills, with Hamish Harwood eighth, Jack Simpson ninth and Kyle Webster in 10th. The early lead belonged to Nathan Crawford, however he went down and eventually dropped out altogether with a tweaked shoulder, also ruling him out of moto two. Fellow Husqvarna rider Luke Arbon was another to shine early, but a crash demoted him all the way back to 21st in frustrating result. The second MX2 moto was all Clout again, picking up the round sweep with double wins and this time ahead of teammate Beaton in his return to the podium overall in second. Third was Katsuya, which secured him the final podium placing overall as well, while fourth was Geran Stapleton’s best result of the season, as was Dylan Leary’s in fifth. Riley Graham had another strong finish in sixth, while Hunter was seventh after being one of many who were penalised 10 seconds for allegedly going inside the circuit markers midway through the moto. Arbon finished eighth after he too copped a penalty, then Joel Whiteman and Hamish Harwood completing the top 10. Jay Wilson was penalised multiple times in the moto for the same reason as Hunter and Arbon, demoting him all the way down to 15th position in a huge hit to his championship hopes.